The 16 teachers were presented by L.A. County Superintendent of Schools Debra Duardo as outstanding classroom educators who have served with praiseworthy distinction. All the county winners will automatically advance, along with other county titlists from around the state, to the California Teachers of the Year competition later in the fall. The top state winner will then advance to the National Teacher of the Year contest that takes place next spring. Hernandez began as a paraeducator at the Moffitt campus in 1993 and, after receiving a teaching credential, she became a full-time teacher for the school, starting as a 2nd-grade bilingual instructor. She was named last spring as the NLMUSD teacher of the year and the district’s entrant into the county competition. Hernandez is the second consecutive county titlist for NLMUSD. 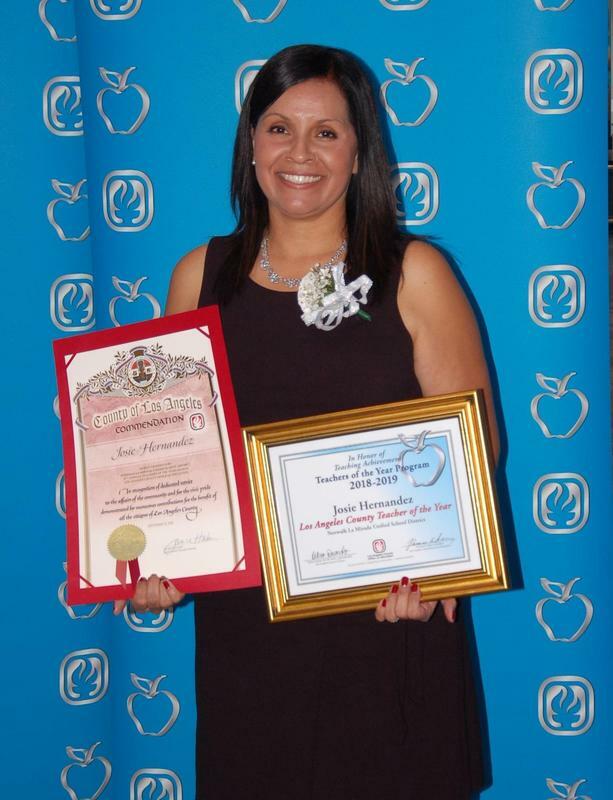 Last year, Jennifer Hodge, a visual arts teacher at Benton Middle School in La Mirada, was named a county teacher of the year. She finished as a finalist in the state TOY contest. Hernandez, 44, a native of Orange County with four children of her own, is the first born of working-class parents who emigrated from Mexico. She is the first in her family to attend and graduate from college. She earned a bachelor’s degree in Spanish linguistics and culture from California State University, Long Beach and a master’s degree in reading intervention from National University. Judged as the county’s top public-school educators for this academic year, the 16 winners were selected from a field of 61 district-level teachers of the year who participated in the 37th annual county contest. The winners will serve as standard-bearers for the teaching profession and their 72,000 classroom colleagues countywide. Each of the winners received a $1,000 cash award from California Credit Union. In addition to Hernandez and Hodge, there have been at least three other NLMUSD educators who have been named as county teachers of the year: Kelly Baker (2013), a district technology coach; Kristine Cvar (2000), the former NLMUSD director of elementary education; and, Gerri Gandolfo (1997), a counselor at La Mirada High School.